For some reason, I must have been unusually excited (or nervous) about Sunday's half marathon as I didn't sleep well at all on Saturday waking up at 3:40am and then 5:40am after twice dreaming I'd missed the race! 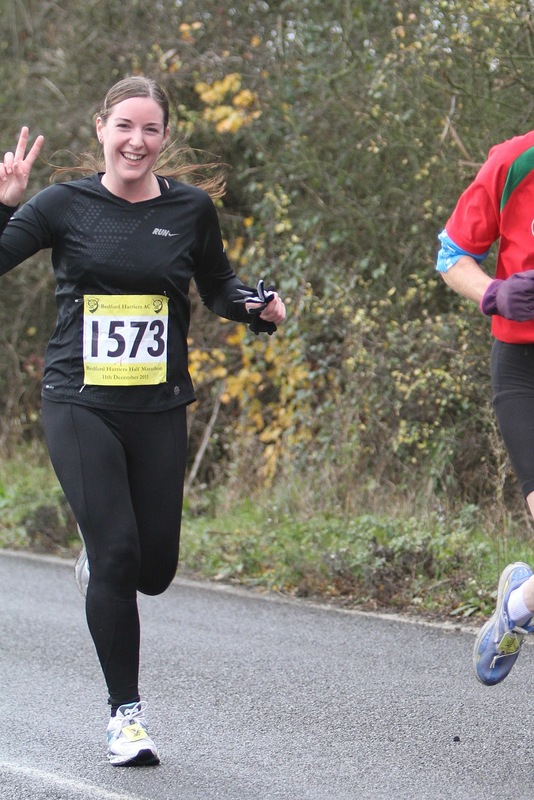 It's very rare I don't sleep before an event, but luckily I managed to drift off again, and eventually rolled out of bed at 6.30am, to be welcomed by freezing temperatures but at least no rain, and headed off to my second Bedford Harriers Half Marathon. As I'm in the middle of my Runner's World Run Streak and am also running about 40 miles a week at the moment to try and achieve my 1000 miles in 2011 target...my legs and feet are feeling pretty knackered and I'm in desperate need of a sports massage! As a result, I didn't hold out much hoping for running a PB (i.e sub 2hrs) but did want to get a better time than when I ran this course last year, which was 2hrs 4mins (you can read about my last attempt here) So, although I had a target in the back of my mind, I was just planning to enjoy the run and not to worry too much if I found I didn't really have any speed, as I had a great time last year, and knew it was going to be a fun morning. The organisation at the Bedford Half Marathon is excellent, and they run buses from local, easy to find car parking to the race HQ, which always works absolutely seamlessly. There were lots of marshals and they're all really enthusiastic and helpful, and I think there's generally a nice atmosphere throughout the race (although there weren't many clapping crowds lining the route this year, but I can forgive the locals as it was absolutely freezing!). Unfortunately though, I think the race is becoming a victim of its own success and the race HQ in a local school now feels too small for the event. With so many people in such a small space, it all felt a bit chaotic when queuing up to collect my timing chip (which could have been posted), to drop my bag off and collect my race memento (a blue cagoule that I'll never wear...would have preferred a medal at the end!). It was just the general impression though and the actual time I spent in queues wasn't very long, I was able to get to the toilets, and everything was achieved efficiently and on time. However, come the beginning of the race, there was a bit more evidence of actual overcrowding. I stood around in the school gym for too long (trying not to get too cold) and didn't head over to line up for the race until 5 minutes before the whistle, so ended up quite a way back from the starting line with runners who were expecting to run slower than I hoped to. The route is pretty hilly, and as my favourite aspect of running is the downhills, I really enjoyed myself, and managed to get some speed up. It always amazes me that people don't try and fly down the hills; rather than just lean forward a bit and let gravity take you everyone seems to run along at the same pace they run the flats. 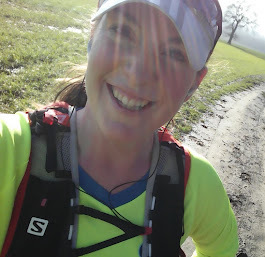 I prefer my way - it's kinda like falling, and can be a bit scary as you're never quite sure if your legs will keep moving quickly enough to keep up with your body, but it's incredibly exhilarating, and it does wonders for your mile pace!! ;) It's what I do, and it always makes me happy. Anyway, on average I stuck to about 9 minute miles for the first 9 miles and I was trying to buy a bit of time to cope with a massive hill that I thought was coming up...it was only after about 10 miles that I realised the massive hill I was expecting was actually part of the Tunbridge Wells half, not this race...and pretty much the rest of the course was flat! A mile away from the finish, I started to really push, as I could see an amazing PB was so close! As it turned out, I started a bit too early, and found the end of the race pretty touch, but I kept going, and finished in an entirely unexpected 1hour 53 minutes!! Couldn't believe I had managed it, and a day on, I am still absolutely over the moon to have achieved my sub-2hr half marathon time before the end of 2011. 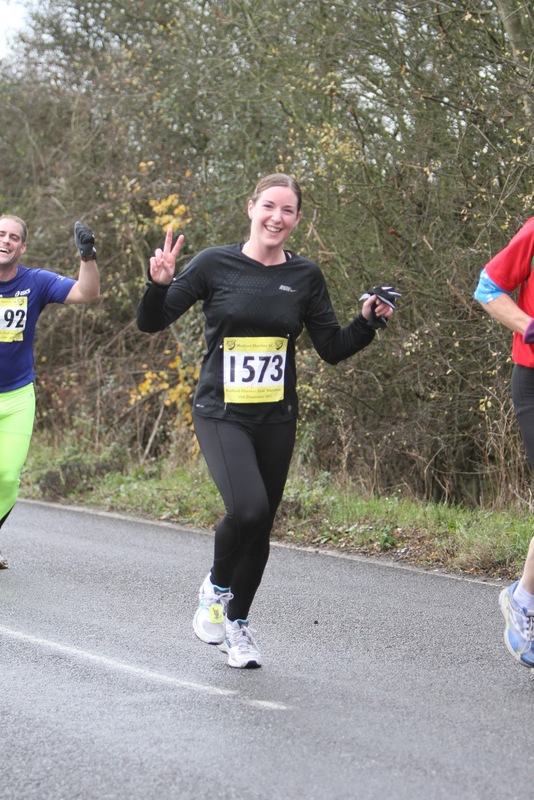 Great race review, and your photo really reflects your energy on the day. Your amazing PB helps me to believe that I will run a sub-2hr half one day!